Suretherm Anti-Condensation Paint (ACP) is a water based internal emulsion which will significantly reduce condensation and mould by utilising Glass Microsphere Technology. Unlike other anti condensation paints, Suretherm paint does not contain any harmful biocides. Walls painted with Suretherm ACP feel warmer to the touch as the heat from your hand is being reflected back instead of being drawn to the colder surface of the wall and escaping. When incorporated into a paint film, glass microspheres act as miniature Thermos-like bottles, providing a thermal barrier between cold surfaces and the warmer ambient temperature within a living space. 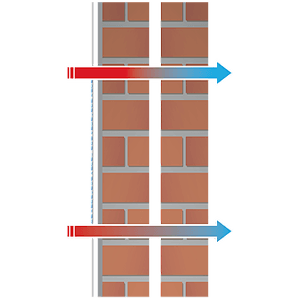 As the air is insulated against the colder wall surface, condensation and mould growth is drastically reduced. Another benefit of Suretherm paint is that it can be overpainted. Anti mould paints and anti condensation paints that are hygroscopic (meaning they attract moisture from the air) cannot be overpainted. This is because the active film will be covered over if you apply a coating over the top. Suretherm can be overpainted or wallpapered which will not effect the performance. Suretherm thermal anti condensation coating can be used in various applications where condensation can create problems where moisture forms and mould grows. Suretherm can be used on most surfaces such as painted/wallpapered walls and ceilings, new and old plaster work, brickwork, concrete, galvanised steel and most painted plastics. It should be noted that to ensure compatibility on metal and plastic, a small test patch should be trialled before commencing full application. Whatever the application, the surfaces must be completely dry before treating to allow Suretherm to work effectively. 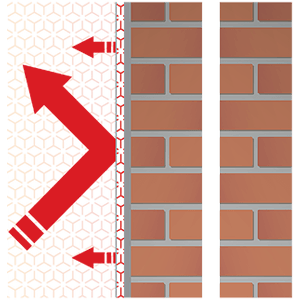 Glass Microspheres within Suretherm paint maintains surface temperatures on treated substrates. This increases the dew point compared to ordinary emulsion which reduces the chance of condensation from forming. Independent tests confirm that surfaces treated with Suretherm paint take twice as long to cool down when compared to ordinary emulsion paint. Condensation takes 57% longer to form on Suretherm coated surfaces compared to ordinary emulsion paint. Suretherm paint can also be painted on cold surfaces such as hand rails, metal handles and other cold to touch materials. The paint retains the heat from your hand which makes the painted area feel "warm".